We’re all addicted to something. Maybe it’s alcohol. Maybe it’s gambling. Maybe it’s something softer like video games or Twitter. Maybe it’s something harder like pain killers or hard drugs. On Sunday, I posted a Twitter poll regarding addiction. Some of my followers posted very courageous stories and admissions about addictions. There were even a few brave souls who emailed me their personal stories about overcoming addiction. They were extremely moving and powerful. Poll: Have you ever been addicted to any of the following drugs? In the past few days I ran across a handful of news articles about addiction that hit close to home, specifically regarding the opioid crisis. 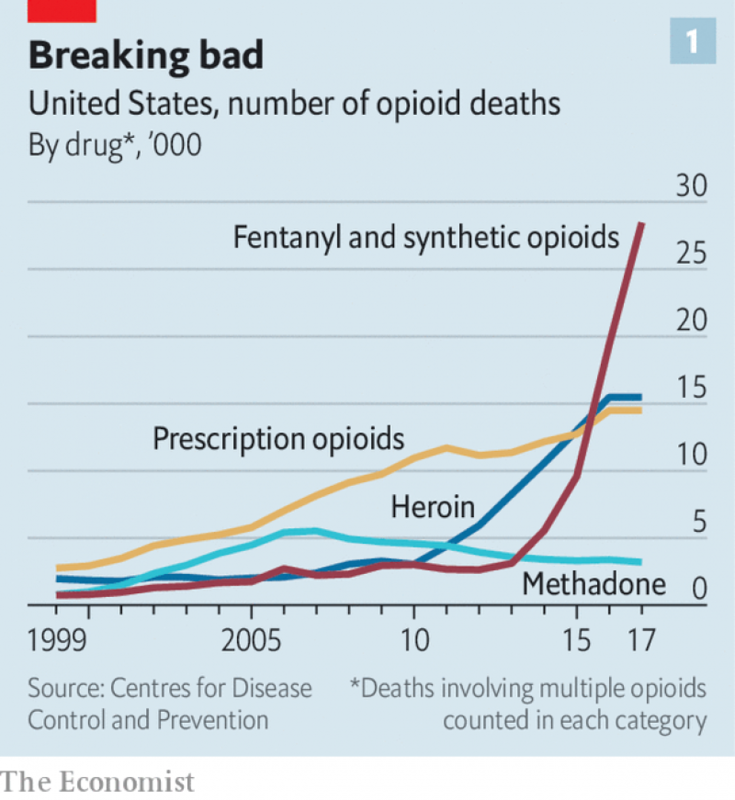 There were some unbelievable stats in a recent article from The Economist, Tens of thousands of Americans die each year from opioid overdoses. Drugs now kill about 70,000 Americans every year — more than car crashes or guns (both 39,000), more than AIDS did at the height of its epidemic (42,000), and more than all the American soldiers killed in the entire Vietnam war (58,000). In 2017 about 47,600 of those deaths were caused by opioid overdose — a fivefold increase since 2000. Only 32% of those opioid deaths involved prescription pills; the rest were from illegal heroin and fentanyl (see chart 1). But three out of four heroin users first became addicted to pills. About ten years ago I got extremely sick and nearly died from a bacterial infection that spread from my tonsils to my liver. I was in an out of emergency rooms for weeks trying to figure out why my body was shutting down. I had multiple liver abscesses that were keeping me ill (one had the circumference of a softball). And they hurt. Every time I moved a certain way I could feel it rub against my rib cage. Every time I coughed or sneezed or laughed or tried to take a deep breath, I felt a sharp pain in my side. The cure for the pain was Percocet (Oxycodone and Acetaminophen). My doctor prescribed 200 count packs of Percocet. They only cost $10 per my prescription plan but a single pill probably had a $10 street value. I never sold any of the pills because I wasn’t a drug dealer and I absolutely needed them to get through each day. After being in the hospital for weeks I went back home to my parents house to recover, summer was just beginning. The first night I got out of the hospital I took some pain pills before I went to bed but I couldn’t remember the exact time. At some point I woke up screaming from the pain and my parents came down to try and comfort me. They asked if I had taken my pain pills. I said yes, but I wasn’t sure how long it had been since I had taken the previous dose. They recommended that I take more. After allowing the newly ingested Percocets a brief time to start working, I felt a little more at ease. But soon after, when I laid in bed, I couldn’t fall back asleep. I noticed that my heart rate and breathing became depressed, which is a sign of any opioid overdose. Under normal conditions, your body controls the breathing rate and depth automatically and unconsciously. I had to consciously think about breathing and it was absolutely terrifying. This went on for what felt like hours until the effects of the Percocet wore away. It felt like the weight of the world was literally on my chest. I almost accidentally overdosed because the pain was unbearable. This probably happens frequently to addicts, maybe their pain is emotional versus physical, and according to the previously listed stats the ending to their story may not end up being as lucky as mine. That was my wake up call. Pain killers were not to be played around with. There are times when we need to ease the pain, whether it be physical or emotional. Pain pills are meant to be used for acute instances, not for long term or chronic use where they can be abused. It took me nearly a year to get through my illness and we never figured out the root cause of it. Throughout that year, I easily ingested 1,500 Percocets, or about one pill every four hours that I was awake, every single day. It was eerily reminiscent of Hugh Laurie’s character on House, constantly crunching on pain pills like they are Skittles. Since I couldn’t go out with my friends and drink at the bars because of my liver issues, I decided to just take pain pills consistently throughout the day to take the edge off. Ironically, this probably damaged my liver more than drinking every day would. I knew I was addicted to the pills, but I also knew, or at least I thought I did, that I understood the risks of taking too many because of my previous scare. It was pretty easy for me to quit cold turkey once the pills were gone because I couldn’t get another prescription filled. For most other people, this probably isn’t the case and they may have constant access to pills which lead to harder drugs, like heroin. If you ever have to use pain pills make sure you follow the dosage rates. And when you are finished with them and feel like you want more, seek help. It is out there. I wanted to share this story because addiction is real and it’s tough to get through. Maybe my story will reach someone who is dealing with addiction and looking for help. How we deal with that addiction defines who we are as a person and how we live our lives.